Pension Boutique Gomerez Gallegos v Granada, Španělsko: Zarezervujte nyní! 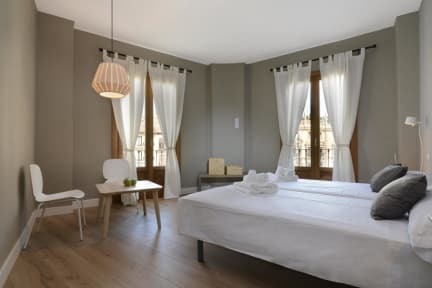 Pension Boutique Gomerez Gallegos will bring you a great quality service to offer you the very best of their facilities and the city of Granada. With a vast experience in the hospitality sector, Pension Boutique Gomerez Gallegos, along with its personnel, is committed to provide you with the best possible service and experience. The Pensión Boutique Gomerez Gallegos is located in the heart of Granada and at the foot of the magnificent red castle Alhambra and the Generalife (15 min walking). Likewise, the Royal Chapel and the Cathedral are just 300 m from the accommodation. You will find Plaza Nueva square just a few steps away from our guesthouse, which is the best departing point to uncover all the mysteries the Albayzín and Realejo neighbourhoods hide in their narrow streets, either walking or by public transport. All guestrooms in our guesthouse are equipped with AC and heating, a flat-screen TV, free toiletries, towels, hypoallergenic pillows and linen. 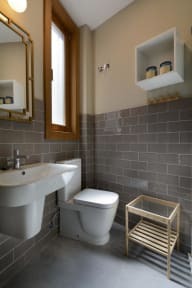 Some rooms at Pension Boutique Gomérez Gallegos also offer a balcony, a kitchenette and a private bathroom. Some other rooms are shared-bathroom. We offer free crib/cot for babies, under request.